Detection by In-situ Hybridization of Pasteurella multocida Toxin (toxA) Gene in the Lungs of Naturally Infected Pigs – PMT (ToxA gene product) produced by P multocida Types A and D are associated with pulmonary abscessation. PMT causes increased vascular permeability and is toxic to neutrophils. Capillary Haemangiomas of the Scrotum and Testicle in Boars. J. Comp. Path. 2008, Vol. 139, 177e186. Scrotal hemangiomas occur frequently, but testicular hemangiomas are rare, and they rarely occur together. The authors suggest an inherited basis since all pigs in the study group were related and of a large white breed. The authors suggest a UV component to the development of scrotal tumors. Vascular-associated Lymphoid Tissue in Swine (Sus scrofa). Vol 58, No 2 April 2008. mononuclear cells were noted in the intima and occasionally the inner portion of the tunica media and adventitia at branching sites. The infiltrating cells were primarily CD3+CD4+ T cells, with some macrophages. Focal accumulations of mononuclear cells in the arterial wall of healthy humans at predilection sites for atherosclerotic lesions. A prospective, case control study evaluating the association between Clostridium difficile toxins in the colon of neonatal swine and gross and microscopic lesions. J Vet Diagn Invest 19:52–59 2007). Clostridium difficile –suckling pigs with mesocolonic edema and typhlocolitis. Brain lesions in pigs affected with PMWS postweaning multisystemic wasting syndrome. J Vet Diagn Invest 19:109–112 (2007). Cerebellar lymphohistiocytic vasculitis and fibrinoid degeneration combined with hemorrhages or with lymphohistiocytic meningitis in pigs with PMWS. piglets. A case study. J Vet Diagn Invest 19:368–375 (2007). High number of mummifications and stillbirths, a high neonatal mortality rate, and many piglets with congenital tremors or hind leg ataxia. 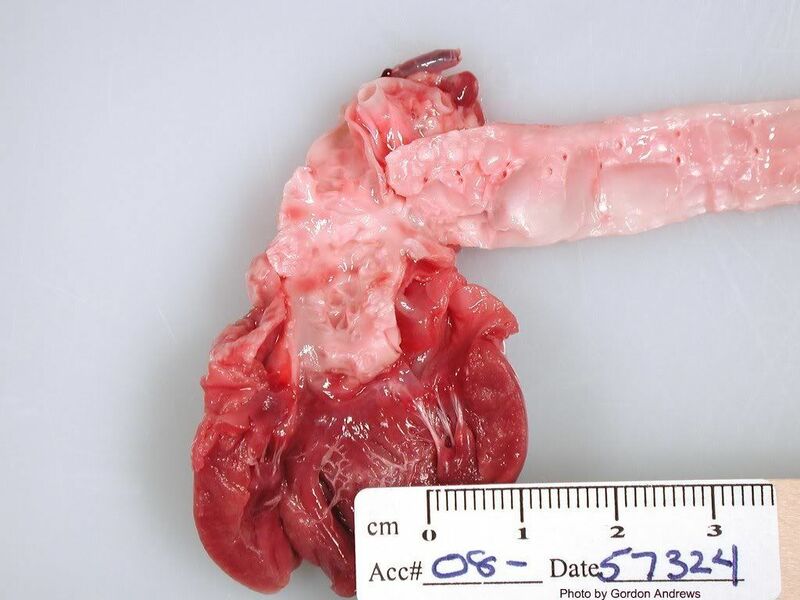 A high load of PCV2 DNA was observed in myocardium, liver, and spleen from mummified or stillborn piglets, lower in piglets with myocarditis, and even further lower in pigs without myocarditis. Neither porcine parvovirus nor encepaholomyocarditis virus was detected. Paramyxovirus infection in pigs with interstitial pneumonia and encephalitis in the United States. J Vet Diagn Invest 13:428–433 (2001). In the last few years, newly recognized paramyxoviruses have been associated with severe disease in several animal species, including swine, as well as in human beings. Recently, a paramyxovirus was isolated from a swine herd in the northcentral United States that experienced an epizootic of respiratory and central nervous system disease. Affected pigs had interstitial pneumonia with necrotizing bronchiolitis and encephalitis characterized by lymphocytic perivasculitis and diffuse gliosis. Other pig respiratory viruses are PRRS, porcine respiratory coronavirus (PRCV), porcine circovirus (PCV) type 2, antigenically variant H1N1 strains of swine influenza virus (SIV), as well as H1N2 SIV in England and H3N2 SIV in the United States have been identified. Historically, only a few viruses had been associated with respiratory disease in swine, and, in field situations, only swine influenza virus (SIV) and pseudorabies virus (PRV) were detected with any frequency. Cytomegalovirus, adenovirus, and enterovirus also have been reported to cause pneumonia in swine but are rarely encountered. Fibroepithelial Hamartoma in a Domestic Pig. Vet Pathol 44:411–413 (2007). Histologic examination revealed a moderate orthokeratotic hyperkeratosis with variable degrees of epithelial proliferation. The main body of the dysplasia consisted of collagenous fibers. In addition, some proliferating small blood vessels as well as focally gathered dilated apocrine glands were evident. Porcine Circovirus Type 2-Associated Cerebellar Vasculitis in Postweaning Multisystemic Wasting Syndrome (PMWS)-Affected Pigs. Vet Pathol 44:621–634 (2007). Acute hemorrhages and edema of cerebellar meninges and parenchyma due to a necrotizing vasculitis resulted in degeneration and necrosis of the gray and white matter. Few to numerous PCV2 DNA and antigenbearing endothelial cells were detected. Detection of caspase 3 activity and DNA strand breaks showed numerous apoptotic endothelial cells in the vascular lesions observed. Lesions in PDNS are characterized primarily by a cutaneous and subcutaneous necrotizing vasculitis and glomerulonephritis and are likely mediated by immune complex deposition. 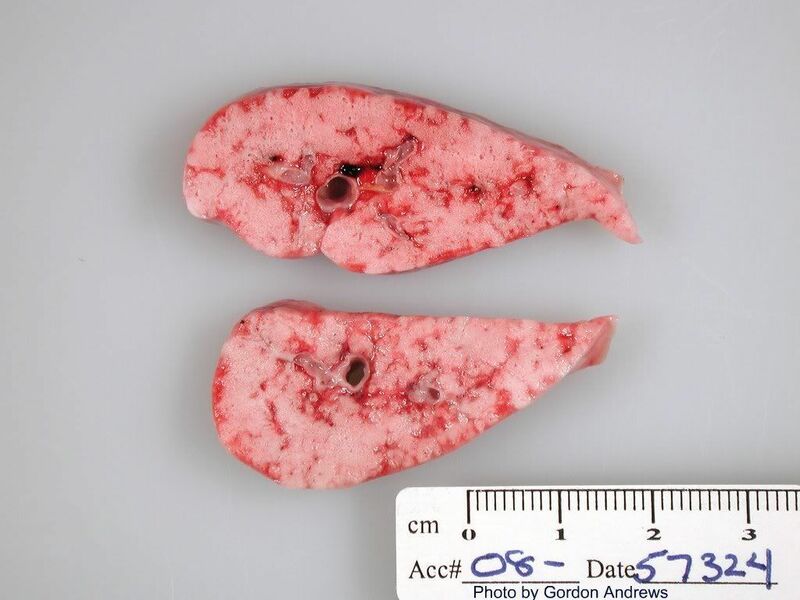 Multiple Hepatic Peribiliary Cysts in a Young Pig. Vet Pathol 44:707–709 (2007). All lobes of the liver contained numerous cysts of varying size containing serous fluid in all lobes. Histopathologically, the cysts were located mainly around the large bile duct and in the connective tissue of the portal tracts. The cysts were lined by a single layer of columnar, cuboidal, and flattened epithelial cells. Occasionally, goblet cells were observed. The epithelial cells were stained with periodic acid–Schiff/alcian blue and high-iron diamine/alcian blue, indicating the presence of neutral mucin, sialomucin, and sulfomucin. The Distribution and Density of Clostridium difficile Toxin Receptors on the Intestinal Mucosa of Neonatal Pigs. Vet Pathol 44:814–822 (2007). The most important virulence factors of C. difficile are 2 large exotoxins, toxin A (TcdA) and toxin B (TcdB). TcdA is a potent enterotoxin with effects on host tissues that are dependent upon receptor-mediated endocytosis of the intact toxin. TcdB is an effective cytotoxin, but it apparently does not bind receptors on intact mucosal epithelium. TcdB is much less toxic in vivo unless there is underlying damage to the mucosa, and it is not essential for the virulence of C. difficile. The receptors for TcdA in the pig remain to be identified, but a-galactosyl does not seem to be significant to its binding. Histopathological and Immunohistochemical Findings in the Lungs of Pigs Infected Experimentally with Mycoplasma hyopneumoniae Histopathological changes consisted of exudates in airways and alveolar lumina, peribronchial and peribronchiolar lymphoid hyperplasia, and enlargement of alveolar septa. These changes coincided with significant increases in the expression of cytokines (IL-1a, IL-1b, IL-8, TNF-a and INF-g) and lymphoid markers (CD4+, CD8+, muramidase, IgG+, IgA+). Characterization of Interstitial Nephritis in Pigs with Naturally Occurring Postweaning Multisystemic Wasting Syndrome Vet Path 2008 Jan: types of tubulointerstitial inflammation seen were: lymphoplasmacytic, granulomatous and mixed. The epithelium of renal tubules was the consistently positive with in situhybridization. Unlike in lymphoid tissue, the amount of PCV-2 was not associated with severity of granulomatous inflammation, but did for lymphoplasmacytic inflam. Metritis, Valvular Endocarditis, and Septicemia by Actinobacillus equuli in a Gilt in the United States. Vet Pathol 45:495–499 (2008). Gross findings included metritis, splenomegaly, and valvular endocarditis. 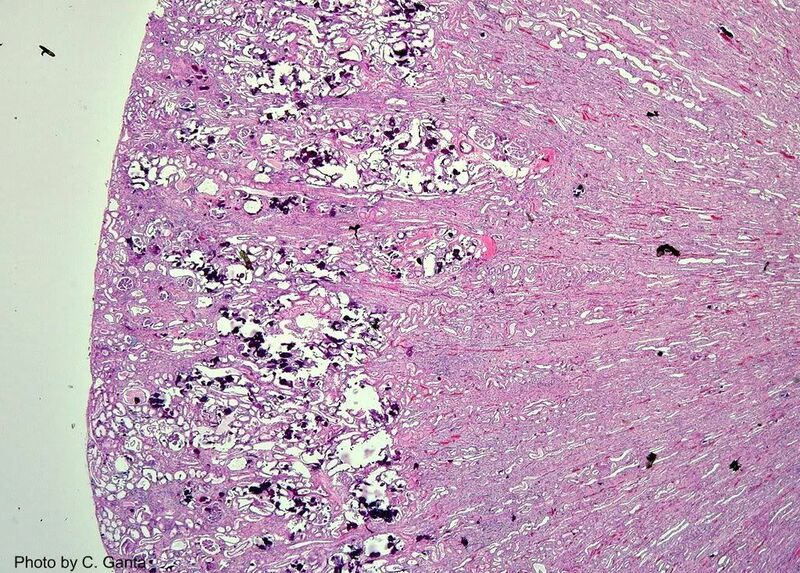 Bacterial endocarditis (in the mitral and tricuspid valves) and metritis with dissemination to multiple organs was diagnosed by using histologic examination. Gram-negative coccobacillary organisms present in the valvular lesions were characterized as Actinobacillus equuli. Reproduction of Postweaning Multisystemic Wasting Syndrome in Pigs by Prenatal Porcine Circovirus 2 Infection and Postnatal Porcine Parvovirus Infection or Immunostimulation. Vet Pathol 45:842–848 (2008). Postweaning multisystemic wasting syndrome (PMWS) was reproduced in prenatally porcine circovirus 2 (PCV2)-infected pigs by either postnatal infection with porcine parvovirus (PPV) or by immunostimulation. Prenatal infection (PCV-2) Plus Postnatal PArvo or immunostimulation or any Post natal PCV-2 infection. But not PCV-2 in utero with no subsequent infection or immunostimulation. Naturally occurring sheep-associated malignant catarrhal fever in North American pigs. J Vet Diagn Invest 21:250–253 (2009). typicallymphoproliferative vasculitis in multiple tissues of the affected pigs. Ovine herpesvirus 2 (OvHV-2) DNA was detected by polymerase chain reaction in the tissues of affected pigs in both cases. The amplified sequences were identical between the clinically affected pigs and the OvHV-2–infected sheep. Additional virological and bacteriological examination showed that the affected pigs were negative for agents that cause Aujeszky’s disease, classical swine fever, porcine enterovirus, and rabies. Acquired Melanosis Caused by Acorn Ingestion in the Nero Siciliano Pig: Diffuse black discoloration of lymph node cortex and medulla and melanosis of fat. Acorns have high total phenolic compounds. Hypothesized that swine tyrosinase could act on phenolic substances found in acorns and increase the biosynthesis andthe anomalous storage of melanin. Conclusion: new pathogenic ETEC fimbrial type in piggeries in Vietnam, with a unique hemagglutination property and attachment characteristics similar to ETEC bearing F5 fimbriae. Investigation into the pathology of shoulder ulcerations in sows. Veterinary Record (2009) 165, 171-174. Stage 1- epidermal necrosis, thrombosis of dermal blood vessels, multiple colonies of bacteria. Stage 2 Dermal necrosis, and multiple colonies of bacteria. Stage 3 – Subcutis necrosis, the periosteum of the tuber spina scapula was reactive and thickened. Stage 4 – Exposed bone of the tuber spina scapula was covered with a thin layer of granulation tissue that was superficially necrotic. tuber spina scapula was extremely deformed and had developed into a mushroom-like shape due to the formation of an excessive volume of osseous tissue (no osteitis or osteomyelitis). The initial lesions were due to thrombosis (failures of the blood supply) and secondary infection. Similar to pressure sores in humans. REVIEW PAPER: Host-Pathogen Interactions in the Kidney during Chronic Leptospirosis. Vet Pathol 46:792–799 (2009). During chronic infection, renal colonization and leptospiruria persist despite cellular and humoral responses by the host. Tubulointerstitial nephritis is the most common lesion associated with chronic infection, and this may progress to fibrosis and subsequent renal failure. For leptospires to disseminate within the host, leptospiral invasion is likely mediated by enzyme secretion, hemolysins, sphingomyelinases. Tubulointerstitial nephritis is a primary lesion during acute renal injury in leptospirosis, with characteristic lesions, such as interstitial edema and lymphocytic infiltrates. proteins called Len (leptospiral endostatin-like) proteins, some of which were shown to bind complement regulatory proteins, e.g., plasma factor H. Pathogenic Leptospira spp. can also bind the human complement regulator C4BP, which can provide added resistance against host complement.5 LPS from Leptospira is atypical in that it activates human cells throughTLR2 and not the conventional TLR4 pathway. Leptospiruria persists despite active immune processes, such as interstitial nephritis characterized by lymphocyte infiltration, anti-leptospiral immunoglobulin production, MHC II expression, and TLR activation. Expression of Major Histocompatibility Complex Class II Antigens in Porcine Leptospiral Nephritis. Vet Pathol 46:800–809 (2009). cytokine-stimulated tubular epithelial cells express MHCII. Leptospirosis in fattening pigs is characterized by several degrees of nephritis, from absence of lesions to severe multifocal tubulo-interstitial inflammation. Nephritic lesions were classified histologically into perivascular lymphocytic (4 pigs), lymphofollicular (6 pigs), lymphohistiocytic (8 pigs), and neutrophilic (2 pigs) pattern. MHCII expression by histiocytes and lymphocytes was observed in all lesions. Prominent MHCII expression in regenerating tubular epithelium was observed in lymphofollicular and lymphohistiocytic nephritis. MHCII contributes to the intensity of the inflammatory response. Brain lesions induced by Experimental Intranasal infection of Japanese Encephalitis virus in piglets. Glial aggregates, lymphocyte cuffs, Olfactory bulb granular cell layer, and neurons of and pyriform cortex. JEV is flavivirus- WNV, St Louis Encephalitis, Murray Valley encephalitis in Australia. Lymphocyte Apoptosis and Thrombocytopenia in Spleen during Classical Swine Fever: Role of Macrophages and Cytokines: Results showed a progressive depletion of splenic lymphoid structures and evidence of platelet aggregation processes. Lymphoid depletion was due to lymphocyte apoptosis, which could not be ascribed to the direct action of the virus on these cells; direct virus action could play only a secondary role in the death of these cells. Absence of severe tissue and endothelial damage, together with moderate procoagulant cytokine levels in the serum, suggest that hemorrhage in CSF is due to thrombocytopenia.Monocyte/macrophages were the main target cells for the CSF virus, TNF- and, to a lesser extent, IL-1 and IL-6 appear to be the major cytokines involved in the pathogenesis of lymphocytopenia and thrombocytopenia. Melamine- and Cyanuric Acid–Associated Renal Failure in Pigs in Thailand. Vet Pathol 46:1156–1159 (2009). 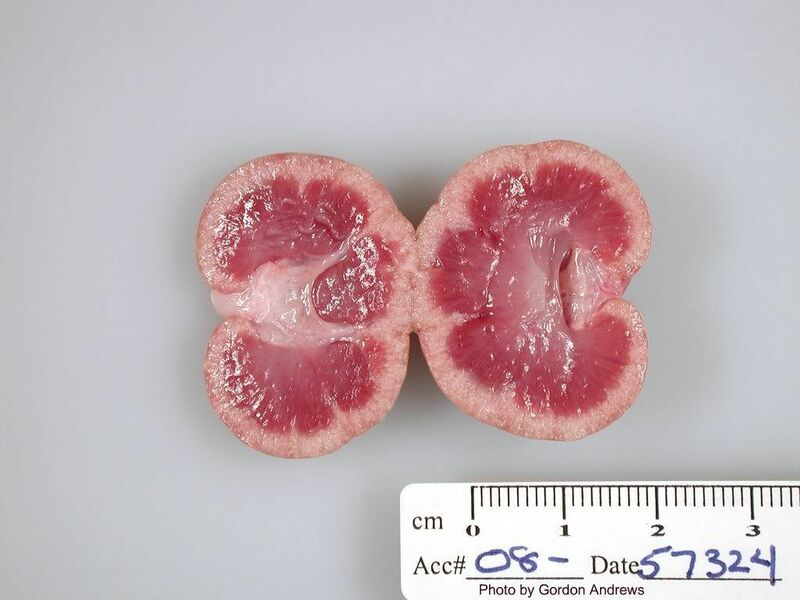 kidneys of all 5 pigs were yellowish and slightly swollen, with precipitation of crystalline material on the cut surface. Histologically, epithelial degeneration and necrosis were evident in proximal and distal tubules and collecting ducts. Round, yellow-brown crystals with radiating striations were diffusely distributed through the lumen of proximal and distal tubules and collecting ducts. Blood urea nitrogen and creatinine levels were elevated. Melamine and analogs, including cyanuric acid, were detected by gas chromatography mass spectrometry. and IL-10 in Experimental Porcine Intervertebral Disk Degeneration. Vet Pathol 46:1292–1300 (2009). TNF-a and IL-10 are involved in the late reparatory phases of the experimental disk lesion. Use of an experimental model showed that strictly disk-directed manipulation and degeneration are also reflected in the contiguous vertebrae, including adjoining cartilage, bone, marrow, and ligaments. Oral squamous cell carcinoma in a Vietnamese pot-bellied pig (Sus scrofa). J Vet Diagn Invest 21:905–909 (2009). chronic, intermittent nasal discharge and sneezing. The animal was diagnosed with severe periodontal disease (grade IV), an oronasal fistula, and multiple tooth root abscesses via dental examination and computed tomography of the skull. Eighteen months later, the animal was evaluated for lethargy, anorexia, and a firm, 12 cm 3 12 cm mass between the 2 rami of the mandible. Skull radiographs indicated osteomyelitis of the mandible and soft-tissue swelling. On postmortem examination, the right mandibular area contained multiple, coalescing, irregular masses extending from the ramus rostrally to the mandibular canine teeth and ventrally within the intermandibular space, completely obliterating the normal anatomy. An open midshaft fracture was present on the right mandible. On histopathology, the masses were confirmed as locally invasive and destructive squamous cell carcinoma. No evidence of metastasis was noted in regional lymph nodes or in any of the distant sites evaluated. Immunohistochemical Detection of Aetiological Agents of Proliferative and Necrotizing Pneumonia in Italian Pigs. J. Comp. Path. 2010, Vol. 142, 74e78. Proliferative and necrotizing pneumonia (PNP) is a form of interstitial pneumonia that occurs in weaning and post-weaning pigs. PNP is characterized by hypertrophy and hyperplasia of type II pneumocytes and coagulative necrosis and granular debris within alveolar spaces. The principle aetiological agent of PNP in Italy therefore appears to be PRRSV (11 of 28 pigs). Coinfection with PRRSV and PCV2 (8 pigs) is characterized by more severe microscopical changes in affected lungs. Systemic Toxoplasmosis and Concurrent Porcine Circovirus-2 Infection in a Pig. J. Comp. Path. 2010, Vol. 142, 228e234: necrotizing inﬂammation of the lung, adrenal glands and lymph nodes, associated with lymphoid depletion, cytoplasmic basophilic botryoid inclusion bodies and protozoal microorganisms. Thanks, keep us posting Karen.